This year’s show, as in the past, will take place at the Nelson’s Dockyard Marina in English Harbour, the Falmouth Harbour Marina and the Antigua Yacht Club Marina both located in Falmouth Harbour. Marina Nights have been designed for the Charter Brokers & Press, however yachts are free to invite None Exhibiting Vendors on board. Registration is done through our Online Registration Portal. 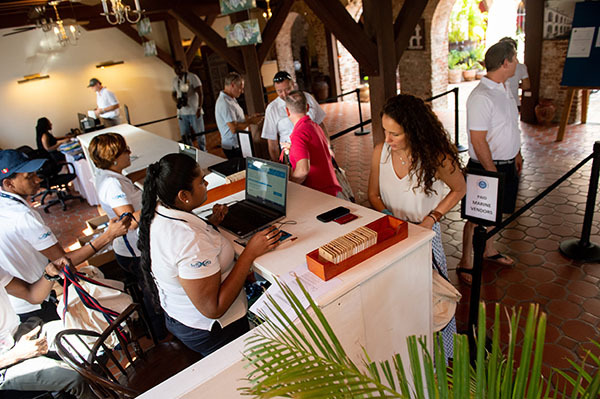 Registration check-in takes place at the Hospitality Desk in Nelson's Dockyard. If your registration fee has not been paid in advance you will be subject to a late fee. Marine Vendors can only register two(2) show participants from each company. This is due to the popularity of this category and to keep the broker:vendor ratio in check. 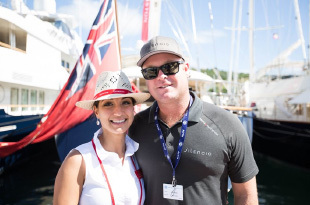 We advise any marine vendor to register and receive confirmation of their participation at the Antigua Charter Yacht Show prior to making their travel arrangements. There is a limit to marine vendors numbers. Your name will not appear on the official List of Attendees on our website until your registration fee has been paid. Cancellations prior to October 15 will get 100% refund. Cancellations after October 15 & up until October 31 will get 50% credit for the next year’s show. Please note that the credit is not transferable and is only valid for one year. 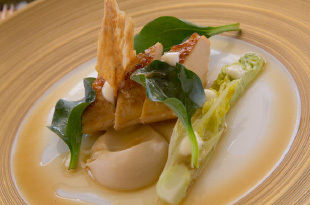 Cancellations on & after November 1 NO refund. Crew Placement Companies will be categorised as non-exhibiting vendors and should register as such. Captains will be advised that Crew Placement Companies (Orange Badges) will be able to visit yachts at any time during show viewing hours, and they should welcome them on board; unless they are busy with brokers. Dockage is NOT included in the registration fee. Please indicate your preferred marina during the registration process, and contact them to book the yacht's dockage and position. The Shuttle service is available between the marinas from 9:30am to 5:30pm. After 5:30pm the Shuttle Service is available until midnight to take you BACK to your hotels in the English Harbour and Falmouth area from the marinas. NB. Please remember that the Shuttle Service is not available to pick you up from your hotel. If a shuttle is not standing by, please call " show shuttle" on VHF Ch.68 or Sheppy Taxi on 1-268-723-0312. The St. James's Club Shuttle will run from 7:30am to 6:00pm. There will be one shuttle at the Antigua Yacht Club Marina during these hours to take St. James's Club guests back and forth to the hotel. There will also be a shuttle standing by at the club. If a taxi is not standing by contact Paul on 1-268-782-9555. Golf Carts: There are golf cart shuttles available at both the Falmouth Harbour Marina and Nelson's Dockyard Marina to transport show participants as close as possible to the yachts. These carts will be parked by at the entrance of the Falmouth Harbour Marina just inside the gate, and at the taxi stand at the entrance to Nelson's Dockyard. The Antigua Charter Yacht Meeting has decided to use the below shipping companies for receiving your shipment . Please note that you MUST contact the company you would like to handle your shipping before sending your shipment, and advise them of the items you are sending. All shipments for the show MUST arrive in Antigua no later than November 28. All charges must be paid to the company that is handling your shipment directly. Notice is given that The National Parks (Trading) Regulations requires persons doing business in the National Park to hold a license issued by the National Parks Authority. The Regulations also prohibit individuals or partnerships who are non- citizens of Antigua & Barbuda, or who are not in possession of a valid work permit issued under the Antigua & Barbuda Labour Code, or a company which is not incorporated under the laws of Antigua & Barbuda or registered as an external company and in possession of a registration number issued by the Commissioner of Inland Revenue from being granted a license. Offenders can face a number of fines and penalties including imprisonment of up to 6 months if caught in violation of the Trading Regulations. This is applicable to the English Harbour and Falmouth Harbour area where the Antigua Charter Yacht Show is held. The Antigua Charter Yacht Show is organized, managed and promoted exclusively by the Antigua Charter Yacht Meeting Inc. (ACYM), a non-profit organization duly organized licensed and operating under the laws of Antigua & Barbuda. ACYM has the sole and exclusive rights to organize plan and hosts the Antigua Charter Yacht Show and all events held during the show are required to be approved by and held under the auspices of the ACYM. We invite you to contact our offices to discuss ACYM approved opportunities that may be available for your business during the Yacht Show to avoid being sanctioned by the Authority.